Evolutiondeck Inc. is pleased to announce that their SPX structural panels have been certified by Progressive Engineering Inc. to be compliant to the IBC and IRC building codes for use on residential and commercial projects. The code compliance report is available online as PER-15098. SPX panels are used in structural wall applications (www.spxwall.com), and structural floor applications. Paverdeck, based on the SPX technology, is the leading galvanised steel structure for decks and floors, and the only full diaphragm unibody structure on the market. Paverdeck attributes include maintenance-free, fireproof, long lifespan, light weight, and superior strength - which combined make it an ideal investment for residential decks, commercial patios, rooftop terraces, docks, storm water management, and other projects. Customers can finish their deck in any compatible material, including concrete or stone pavers, porcelain tile, concrete or traditional decking materials. This certification helps homeowners, contractors, and the architectural communities realize the full value of the Paverdeck structural panel in their construction investments. Progressive Engineering Inc. has provided Professional Services for over 37 years with areas of expertise in Architecture, Engineering, Surveying, Soil Borings, Product Testing, Product Evaluation, Third Party Review and Inspections. Evolutiondeck Inc., an engineering company founded in 2007, has roots from the automotive and steel industries, and manufactures the Paverdeck system for custom and DIY installations. Material kits are available from regional dealers, including Menards. 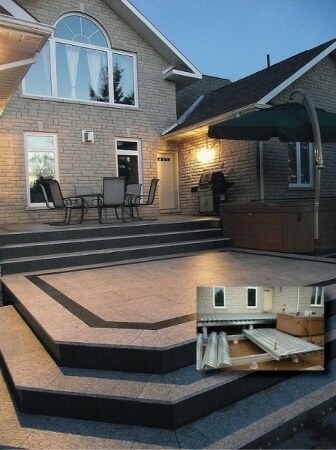 For more information about the Paverdeck system, visit http://www.paverdeck.com, http://www.facebook/paverdeck, or contact us at 1-800-725-5228 FREE or mail(at)paverdeck(dot)com. Paverdeck® is a registered trademark under license to Evolutiondeck Inc.